Thermaltake has introduced a new lineup of high-end PSUs featuring RGB lighting. 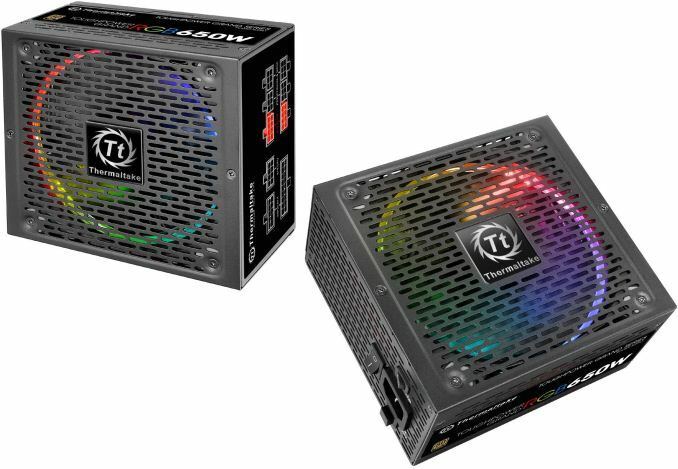 The new Toughpower Grand RGB Gold power supplies are equipped with 256 colors 'Riing' RGB fan, featuring five lighting modes as well as all the regular attributes of advanced PSUs, including a modular design, flat black cables, a "smart" fan, as well as a 10-year warranty. The Thermaltake Toughpower Grand RGB Gold lineup of PSUs are compliant with the ATX 12V v2.4 and EPS v2.92 specifications, carry the 80 Plus Gold spec badge and are designed for full-size desktops/workstations (in fact, the 850 W model even has two 4+4 CPU power connectors and thus can handle dual-socket systems). Like other high-end PSUs, the Toughpower Grand RGB Gold power supplies feature a modular design, Rubycon capacitors (rated for 105°C/221°F), a high amperage single +12V rail design (see the table for details) as well as a 140 mm fan that can shut itself down completely when the load is below 20% (it is possible to keep the fan on at all other times). Thermaltake also indicated that the PSUs feature a very strict voltage regulation circuitry (set for no more than a ±2% variation) with a very low 30 mV ripple noise. One of the key selling points of the Toughpower Grand RGB Gold is its Riing 14 RGB fan with a hydraulic bearing as well as multiple LEDs that can work in five modes: 256-color RGB cycle, solid red, solid green, solid blue or solid white. The modes can be set using a single button and then the PSU will remember them even after a shutdown. As for connectivity, the Thermaltake Toughpower Grand RGB Gold PSUs come with four or six 6+2-pin PCIe power plugs for graphics cards (so, the 850 W model can handle three AMD Radeon R9 Fury graphics cards or two highly-custom EVGA Kingpin GPUs that need three power connectors), 9 or 12 SATA power connectors, Molex connectors and 4-pin plugs for floppy drives and other peripherals such as fan controllers. All cables are flat and black. The Thermaltake Toughpower Grand RGB Gold series PSUs are already available from multiple retailers, including Amazon. The top-of-the-range model costs $119, whereas the 650 W and 750 W PSUs cost $89 and $99, respectively. Apart from the Toughpower Grand RGB Gold lineup, Thermaltake is also working on more affordable Smart Pro RGB Bronze PSUs, which are expected to hit the market in 2017. The Smart Pro RGB Bronze PSUs will feature the same RGB fan as the Toughpower Grand RGB, modular design and premium components, but the Bronze rating and a seven-year warranty.
" 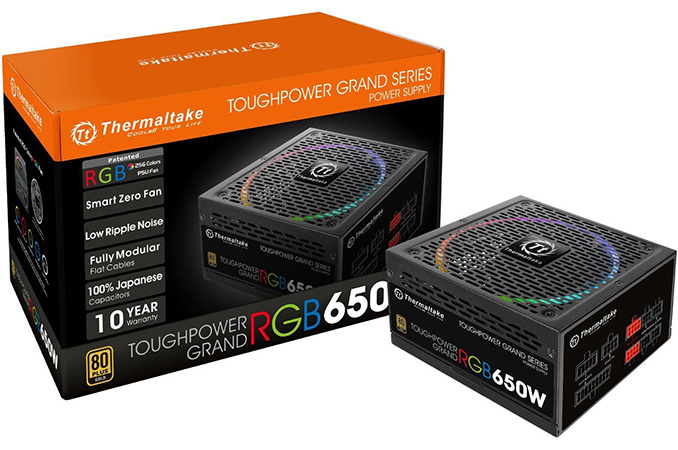 The new Toughpower Grand RGB Gold power supplies are equipped with 256 colors 'Riing' RGB fan"
As a general comment - not picking on Thermaltake in particular because everyone else does it too: But am I the only person who thinks that in the rush for the maximum possible number of connectors on every string that PSU companies are missing half the potential benefit of modular cabling. Yes, it means we no longer have entire useless strings of connectors to ball up somewhere out of sight; but we still do have to do that with the ends of each cable. Increasingly builds only need 1 or 2 sata connectors in the front drive bay area (for an SSD and either an HDD or ODD but not both). In cases that're short front to back, even if there is an ODD opening, it's probably by itself with the other drives either below or behind the mobo. But, depending on brand we either get 3 or 4 connectors on every stand; and they're all sized for maximum reach.